Considering the increasing environmental concerns and the awareness of consumers, the companies today’s are switching to sustainable product packaging to please a more educated and savvy consumer. Aligning your companies products packaging toward sustainable materials will not only help you reduce environmental footprints but it will create brand loyalty among customers. 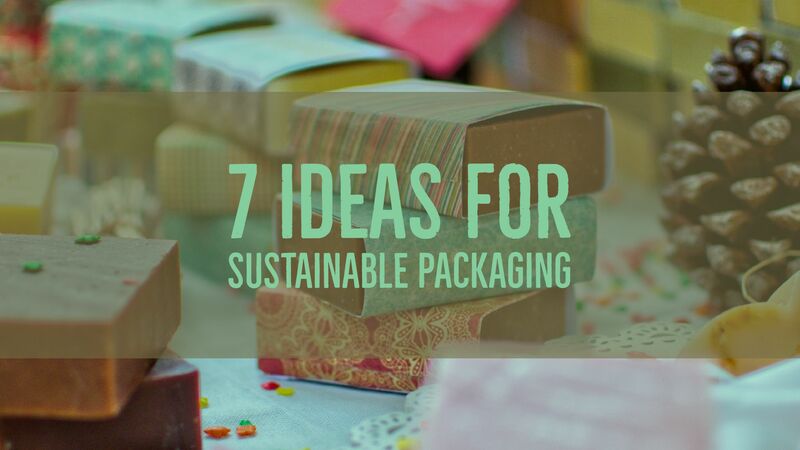 So we have created a list 7 Ideas for making your product packaging sustainable. Use Ecological and Recyclable materials: While designing packaging for any kind of product, it is very important to focus on the material which you are going to use. In fact, it is a crucial step which can impact the technical and structural features of the final product. Using materials which causes pollution, hard to dispose of or composed of toxic waste, are highly hazardous both for the environment and the whole ecosystem. Biodegradable plastic — Biodegradable plastic — Biodegradable plastic is a plastic that decays normally in presence of sunlight. Biodegradable plastics are made from natural materials such as corn oil, orange peels, starch, and plants. Biodegradable plastic is a feasible and practical alternative to traditional carbon-based plastics. Even though biodegradable plastics have somewhat higher cost to create as compared to traditional plastic. Biodegradable plastics holds various advantages with a lesser impact on the environment when disposed of properly. Corn-starch — Instead of utilizing packaging materials produced using synthetic materials, you can utilize material made from poly-lactic acid(PLA), which is generally produced using fermented sugars, and usually from cornstarch. The packaging material made from cornstarch will break down into carbon dioxide and water within several months when disposed of correctly. The materials produced using corn starch are biodegradable which is essential for the environment. One advantage they have is that it can be used for all types of food packaging. Cardboard and paper — These are the paper-based materials which are lightweight, yet strong. Cardboard packaging can look top of the line, without much investment. Paperboard can be easily cut and resized to create custom shapes and structures. 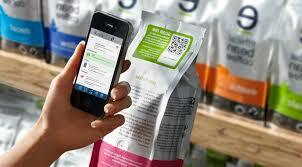 They can be used to pack products ranging from smartphones to frozen food to medicines. Light Weighted Packaging: In the midst of regularly growing concern for environmental sustainability, lightweight packaging will be the at the forefront of global R&D. The race to create thinner laminated structures without compromising on the overall quality and useful properties like strength This is due to raising customer awareness about packaging from the Pull by the Conscientious Consumers, consequently the Brands much as it is to the Push by Converters taking into account them. Lighter packaging consumes less fuel in shipping which helps in energy saving. Recover and recycle material: Collection of packaging material with the end goal of re-utilize, reusing will serve the purpose of sustainability. If we take the example of Plastics which often empower makers to deliver more product with less packaging and saves the overall cost of the product. For e.g PET packaging offers many advantages– it is light, strong, cheap, resealable and it is also 100 per cent recyclable. Companies today can take up the initiative to come up with a recycling campaign which encourages recycling of such products. Here is one such Example by Coca-Cola. “Alag Karo — Har Din Teen Bin” is a source segregation initiative by Coca-Cola India in partnership with Saahas, Tetra Pak and GIZ. This Project will train waste workers in segregated waste and by providing innovative solutions for collection and handling, thereby improving their potential livelihood from waste. This is being implemented with the support of the Municipal Commissioner of Gurugram. Avoiding Over-Packaging: Utilizing a big box for a small product does not make sense. It is a total waste of raw material. What you can do is make custom packaging boxes for as per your product requirement. This will help you with saving materials and space all through the whole transportation process. A lot of wastage like this happens in the warehousing and retailer levels. A moderate packaging won’t just set you apart from your competition but will likewise be speaking to the Eco-conscious customers as well. digitized development and maybe the QR code which will be used to provide additional information. Digital components can offer buyers as much information as it could be expected about products without overuse of materials and resources which affects the earth. An incredible innovation that will lead to less physical waste which connects with our moral values on sustainability. Re-usability of packaging: When you can design packaging with a re-usability, you not only cut down on waste, but you help your customers remember your brand/product every time your packaging is re-used. 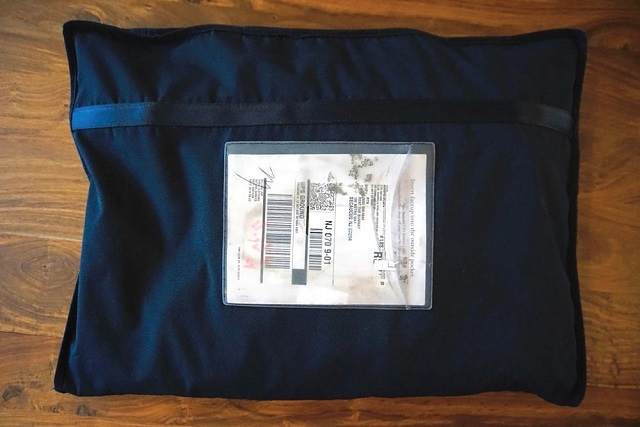 An extraordinary case of reusable packaging is Rent the Runway’s bag shippers. They utilize the overwhelming cotton bag again and again, and the only the label has to be reprinted. They are likewise eliminating waste in the fashion industry by giving consumers the opportunity to borrow instead of buy. Use Sustainable Material and Innovative Technology: For printing pictures and text on your package, you can utilize soy-based ink instead of traditional petroleum-based ink which are more harmful to the environment. On top of this soy-based is generated from sustainable natural resources. Another Example is Molded Fiber Printing — It is nothing new, but this new technology enables high-resolution colour graphics to be applied directly on the surface of moulded fibre packaging. The Benefits of this are low per-unit cost and higher production rate. 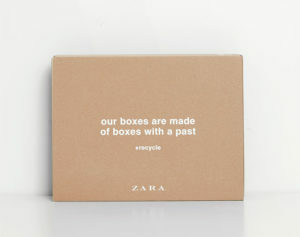 boxes into an advertising motto “our boxes are made of boxes with a past.” Their cases are cardboard ones, produced using reused materials. Iceland Foods Ltd — the British chain of supermarkets has made a move to pull back from utilizing plastic in any of their own-label items. McDonald’s has recently reported changes in their packaging approach, while at the same time an ever-increasing number of small organizations are moving towards cardboard solutions. 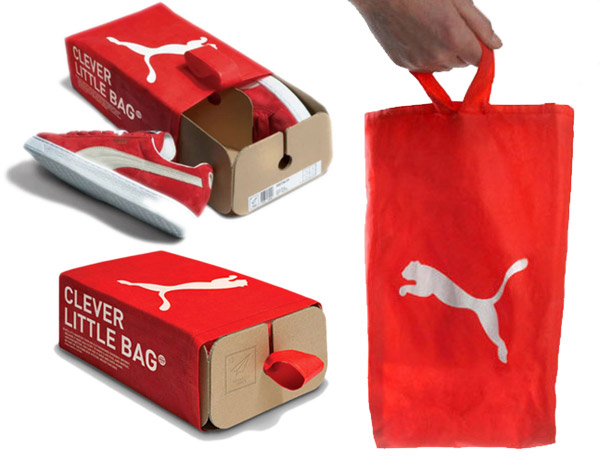 The bag introduced by Puma which packs their shoes is another case of ecological and sustainable packaging. The organization structured a cardboard sheet and made the bag. This helped them to spare 65% of cardboard. The bag has no covered printing. It weighs less, which is a plus in transportation and takes up just less space. Additionally, the requirement for another bag to carry the shoe is eliminated in this situation. Keep in mind that ensuring your product’s packaging is ecological will not just demonstrate your organization’s responsibility towards the environment, In addition, it indicates your commitment to the community and environment in general. Awe! your customers with creative custom packaging that catches their eye, as well as sets a case to others how Eco-friendly alternatives can be particularly powerful in arousing customer interest. If you are looking for more options for creating custom sustainable packaging, You can check Greenhandle, A leading online packaging material Supplier, providing custom boxes and packaging for startups. Previous articleWhy Use Custom Shopping Bags ?